The High-Spectral-Resolution (HSR) – technique (Shipley et al., 1983) is used for the determination of particle backscatter and extinction coefficients in the studied atmospheric volume. The equations are similar to those of the Raman Lidar technology. Both techniques have the advantage compared to a "simple" backscatter lidar, that these 2 parameters of particles are determined from 2 independent measurements. This reduces significantly the error due to incorrect assumptions. The high-spectral-resolution technology uses elastically backscattered light, thus these lidars can be applied during daytime. Spectrum of the backscattered radiation the molecules (blue) and the particles (yellow) at a temperature of 15 ° C and a pressure of 1000 hPa. An HSR channel separates the light that is elastically bachscattered by molecules of the light from that light that is elastically backscattered by particles. Thereby is used, that the Doppler broadening of the light backscattered by molecules is significantly greater than that of the light backscattered by particles. These different Doppler broadening is caused by the much higher speeds of molecules than that of particles in the atmosphere. An iodine cell is often used in a HSR channel when the wavelength of the emitted laser light is at 532 nm. The (seeded) laser is operated in such a way that its wavelength exactly matches the wavelength of a suitable iodine absorption line maximum. The backscattered light is changed spectrally after passage through the iodine cell because the light backscattered by particles is completely or almost completely absorbed. 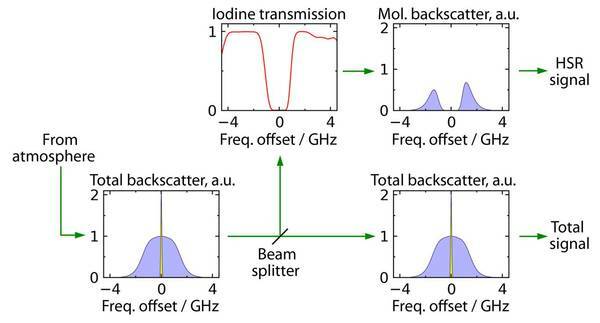 After passage through the iodine cell, a signal is detected by the HSR channel that is essentially caused by molecular backscattering. 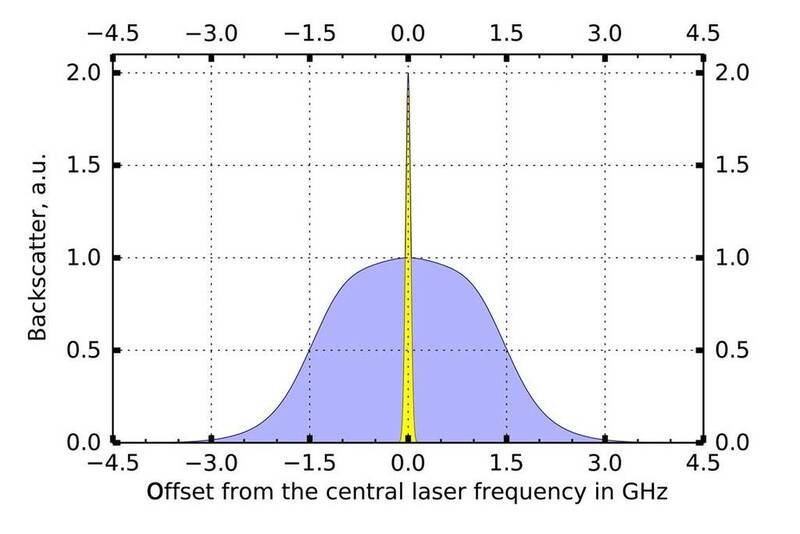 Principle of the HSR lidar: part of the elastically backscattered light is recorded by the total channel for detection of molecular and particle backscattering (Total signal). 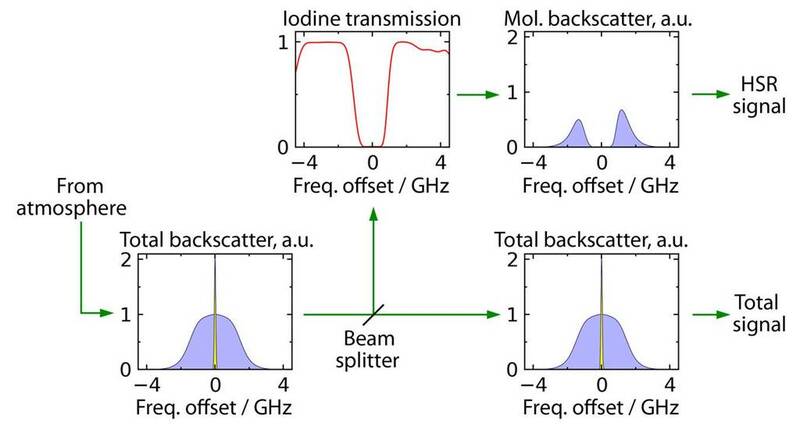 From a second part of the backscattered light, the part of light that is backscattered by the particles is suppressed by a narrowband filter (iodine cell) and the remaining light (from mainly the molecular backscattering) is detected (HSR signal). κmol und κaer are factors that describe the damping of the filter in the HSR channel. You can find the explanation of the other characters in this equation here. 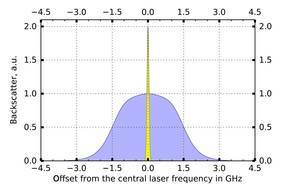 It should be noted that the frequency of the emitted and the detected light differ only by maximum of 3 GHz, so the wavelengths are more or less equal. Filled tube blackened and with copper sheath. An iodine cell is used to build the filter in the HSR channel. 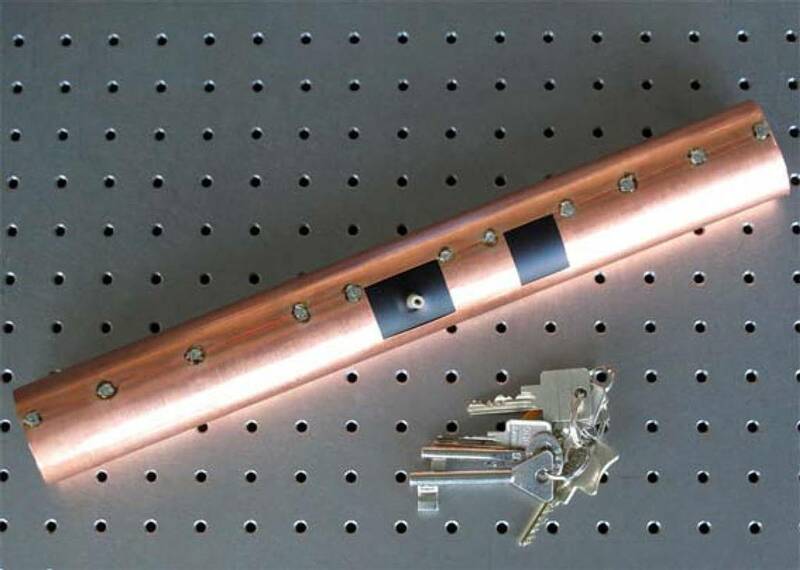 An approximately 40 cm long glass tube with two optical windows on its fronts had been evacuated and then filled with iodine (taking advantage of its equilibrium vapor pressure of 137 Pa) at 40 ° C. This cell was installed in a temperature-controlled mounting, whose temperature is kept constant at 35 °C during operation. All other elements of the HSR channel are built up like the other channels of the lidar.